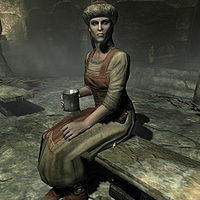 Lisbet is a Nord and the owner of the Arnleif and Sons Trading Company, a general goods store in Markarth. After her husband's death, she was handed management of the store. She also informs you that the store has fallen on hard times due to recent Forsworn attacks. One of their shipments is missing as a result of those attacks, including a Dibella Statue that is worth a substantial amount. Lisbet's Dibella Statue can be retrieved from a chest in an assigned Forsworn camp and returned to her for a reward. She wears a set of merchant clothes, including a hat and a pair of boots. She wields an iron dagger and carries the key to her general goods store, as well as common loot and gold. Lisbet is revealed to be a cannibal in the quest The Taste of Death, along with other individuals in Markarth. If you tell her that you know her at the dinner she will remark: "One of my customers? Did you know I inherited the store from my late husband? Shame what happened to him. He had such good taste." Attempting to ask her about her cannibalistic nature outside of the shrine will cause her to become worried and say: "Shh. You mustn't speak about such things away from the shrine. Only you and your dinner guests can know." On your first visit to the store you overhear her and Imedhnain passing comment on the recent commotion in Markarth marketplace. Imedhnain asks her "Did you hear all that noise outside? ", to which Lisbet assures him, "It's just the market rabble. We should get back to work." She will then acknowledge your presence in the store with "You there. If you're here to trade, step up to the counter." Upon approaching her, Lisbet may inform you that "Arnleif and Sons Trading Company buys and sells anything you wandering types need." Initiating dialogue will prompt her to say: "No, I'm not Arnleif. Yes, I know it's called Arnleif and Sons. "; "The selection seems small, but we can provide whatever you need. Just ask. "; or "I love hearing Ogmund sing at the inn. He's a true skald." Upon completing transactions, she will tell you to "Come back whenever you need something." or "If you need anything else, just ask." If you ask her who Arnleif is, she will inform you "I inherited the store from my husband. His father was Arnleif. ", continuing with more information about her late husband, "My husband, Gunnar, died about five years ago. Forsworn attack. I miss that stubborn oaf." If you remark about the recent attack in the marketplace, Lisbet will reply with "No. As if trade wasn't poor enough. Now there's violence in the streets. ", "It was the Forsworn, wasn't it? I lose dozens of shipments every season to those barbarians. Now they're in the city? Gods help us." Commenting upon the neglected condition of her store will cue the response "Oh, by the Divines is it that obvious? I swear, if my Gunnar was alive to see me now. ", informing you that "This store would finally be on its feet if I hadn't lost my last shipment to Forsworn attacks. A specially-made Dibella statuette." She will then inquire if you are currently for hire. Agreeing to this will initiate Lisbet's Missing Shipment quest. Lisbet: "Imedhnain, I was just comparing the ledgers from last season." Imedhnain: "Not too bad, I hope?" Lisbet: "Worse. The loss of shipments from Forsworn attacks are really hitting us hard." Lisbet: "Where's Cosnach, is that lazy idiot out drinking at the Silver-Blood Inn again? On my coin?" Imedhnain: "He's just waiting for the shipments, Lisbet. He'll be back as soon as they come in." Lisbet: "There are no shipments scheduled today. Stop covering for him!" Imedhnain: "He's my cousin. Just give him another chance. Please." Lisbet: "Fine, I won't fire him, but I'm doing this for your sake. Not his." Cosnach: "No shipments have come in." Lisbet: "What do I pay you for, to stand around all day? You're supposed to be bringing goods to the store." Cosnach: "There are no goods to bring to the store. That's what I'm saying." Lisbet: "Where are my goods? Did the shipment come in?" Cosnach: "Only a few things came today. Cedran said he'd drop it off later." Lisbet: "Cedran said he'd... what am I paying you for? Next time, you bring the shipment in yourself." If you have completed Lisbet's Missing Shipment before talking to her in Reachcliff Cave, she will instead say to you "That's right. You're the sellsword. Thank you again. It's so nice to have help with my husband gone. Shame what happened to him." Lisbet is listed in the game files as being in a secret relationship with Thonar Silver-Blood. In Reachcliff Cave, Lisbet will mention that she ate at least some parts of her brother in conversation with Hogni. This page was last modified on 7 June 2018, at 17:34.